By Cecil R Humphery-Smith, OBE, FSA, FHS Coat of Arms No. 201, Spring 2003. When I first encountered the tomb of King Henry IV and his Queen, Joanne of Navarre, on the north aisle of the Trinity Chapel in Canterbury Cathedral some sixty years ago, I was, of course, intrigued by its heraldry and spent many years studying the little shields composing the frieze of the canopy. (1) Without making any further reference to the heraldic decoration of this tomb, I want to deal with the nature of the tomb itself and the tomb of Henry’s cousin, Archbishop Thomas Arundel. The late Dr John Harvey suggested to me that Robert Brown, who lived in The Savoy, London, may have been the sculptor of the portrait effigies of Henry IV and Joanne of Navarre between 1414-1421. The King’s chief carpenter, William Toutmond, who died in 1415, was quite likely the craftsman of the tester canopy, although such very delicate woodwork may well have been designed and partially executed by John Wydmere, who was chief joiner from 1394 until his death early in 1417. Such fine work may well have occupied a couple of craftsmen for several years, so the design would have been completed by the start of 1413, if not at the earlier date of 1409, as I had previously implied. The story of local guides and some books on the history of the Cathedral, suggesting that the tomb was not built until after the death of Joanne in 1437, cannot be sustained on any evidence, least of all archaeological. Figures and mourners (who do not appear in the heraldry, as one would have expected) are not represented in the niches made for this purpose. Indeed, there seems unlikely to have been any such figures originally. It is not difficult to compile a list of those who might have been expected to attend the funeral of Henry. One wonders, however, on the evidence, if he had thought very much about his own tomb. It has always struck me as a curious monument, by comparisons, better suited to a member of the episcopacy. In fact, viewing it from above, it can be seen that the couple are on a somewhat cramped bed. I had this opportunity of so viewing the figures from the top of scaffolding when the railings had been removed and before all the sandbags were in place during the 1939-45 war. Also, as a teenager, I was guided in St George’s Chapel, Windsor, by the late Queen Mary, following a unique encounter at the South Audley Street premises of the book publishers Batsfords, and passed by the tomb where King George Vs effigy was then unaccompanied by Her late Majesty’s. The Windsor monument and other double effigy tombs do contrast with the Canterbury monument. The shields of Royal Arms at the ends of the tomb are held by angel figures and do not look to be of the quality of the rest of the heraldry, even if they are contemporary. This feeling may have been achieved by restoration, but the more appropriate person to have had this tomb would have been Archbishop Thomas Arundel. He would have rested comfortably upon the tomb in effigy, opposite Courtenay, on a fitting monument with niches for saints and the angels to support his noble coat of arms. The board at the head of the tomb was painted with the representation of the murder of the saint of Canterbury, Becket, after whom Arundel was named, and the board at the foot of the tomb represents the cult of the devotion to the Blessed Virgin assumed into the Heaven and crowned Queen of Heaven, which had been among Arundel’s answers to Lollardy. Naturally, an ageing medieval archbishop would have made advance arrangements for his own burial and tomb. His would have had no need for a tester canopy. Again, guide books will suggest that Henry chose to be buried opposite the tomb of Edward of Woodstock, known as “The Black Prince”, because he had usurped the throne of his son, Richard II. Yet, Edward strictly requested that he should be buried in the crypt in front of the altar of Our Lady Undercroft, and it is likely that he was. The famous tomb was probably erected in the Trinity Chapel subsequently. But Thomas Arundel did not die until the 19th February 1414, eleven months after Henry IV. He had, I submit, already given over his tomb in the Trinity Chapel to his cousin, the King, who had expressed his wish to be buried in Canterbury. That is my thesis. From Hackington, the Archbishop’s body was taken to a spot next to Chillenden’s tomb in a new Chantry Chapel in the Nave near the site of the present pulpit. The monument was much destroyed by the vandalism of the 17th century. I strongly suggest that, in the 18th century, when the Nave was re-floored, the existing monuments were tidied to the walls and the ledgers were removed to the transepts and cloisters, the remains of Arundel’s tomb were used to refurbish part of the Great Cloisters to produce what many erroneously call a lavatorium. or meals (Figs. 2 and 3). If such a washing place were ever built, the congestion at meal times must have been enormous. There were plenty of facilities and waterworks to support such a lavatorium along the Cloister that led out of the Great Cloister north aisle into the refectory. It would have had to have been, at least, of the dimensions of those at other Benedictine abbeys, at Gloucester (for example) and not in two small bays. Studying early descriptions as we have of the decay of the Cloisters and the refurbishing of them during the 18th and 19th centuries, along with Victorian and modern pseudo-Gothic restorations on the Garth side, there is much evidence to confirm the inaccuracy of the attribution to these bays. They have nothing to do with any lavatorium. Three shields of arms appear on each of the arches of the two bays in the Cloisters (Fig. 4). There is no heraldic decoration on the Cloister Garth side. On the easterly arch in the centre is the insignia of the Metropolitan of Canterbury as Azure, a cross-staff or, its cross argent over all a pallium argent charged with three crosses formy fitchy sable, impaling the Archbishop’s arms for Arundel, Quarterly, all within a bordure engrailed argent, 1 & 4. Gules, a lion rampant argent, (FitzAlan), 2 & 3. Chequy or and azure, (Warren). On each side the arms of Arundel are impaled respectively by de Bohun, Azure, a bend argent cotised or between six lions rampant or, and by England differenced, Gules, three lions passant guardant or and a bordure argent, for the Archbishop’s two sisters. Richard FitzAlan, Earl of Arundel, married, as his second wife. Eleanor Plantagenet, daughter of Henry, Earl of Lancaster. They were the parents of Thomas Arundel. the Archbishop, and of his two surviving sisters, Alice, who married Thomas Holland. Earl of Kent. 10th April 1364 and died 17th March 1415/16, and Joanne who married, after the 9th September 1359, Humphrey de Bohun, Earl of Hereford, Essex and Northamptonshire, father of Henry IVs first wife Mary. Joanne was the benefactress of Walden Abbey, and she died the 17th April 1419. On the westerly arch are the arms of Henry IV. Qly France Modern and the leopards of England. Henry V cannot be intended for this central shield because he is represented by one of the two other shields in this bay and his own son had yet to be born (in 1421). On either side of the Royal Arms are the arms of Prince Henry of Monmouth, the Royal Arms and a label Argent, and those of Thomas of Lancaster, the Royal Arms with a label Ermine. These were the late king’s two eldest sons. Henry of Monmouth became King Henry V, crowned at Westminster a few months before the death of Archbishop Arundel. He was the heir to the estates of de Bohun. Thomas Plantagenet was created Duke of Clarence in the previous year. One would expect to have seen a red canton on each of the tabs of the Ermine label. Close inspection reveals a canton present on each tab. Repainting has been carried out several times but early records do not suggest any other arms than those described here. Clarence was killed at Baugé, Anjou, and buried in Canterbury Cathedral to which his widow was a very substantial benefactress. It would appear to be demonstrated that Henry had been given Arundel’s tomb some short while before his death, no effigy of Arundel having yet been carved. On the canopy slung above it Henry gathered together armorially those whom he believed to be loyal to his long-held cause for a Crusade. Arundel’s more hurriedly constructed monument, also no doubt built during his lifetime, was, I submit, dismantled after being vandalised in the seventeenth century and its two sides, of roughly the right shape and dimensions for the purpose, served to provide for the repair of two Cloister bays, leaving them, attractively, without the mullions that they formerly had. The bays chosen were apposite, Arundel’s arms decorated a ceiling boss and the remains of the top of his tomb that once carried a brass rather than a carved effigy is set in the floor below. Measurement of that slab and matrice fits the argument well. 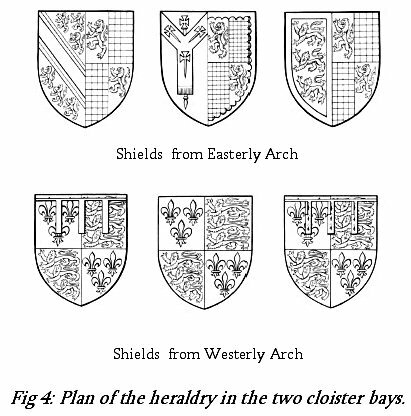 Heraldry has provided a large part of the supporting evidence for these conclusions. 1. A paper was delivered to The Heraldry Society meeting in the 1950s with further articles on later occasions and also lectures to the Cambridge University Heraldry Society over subsequent years. 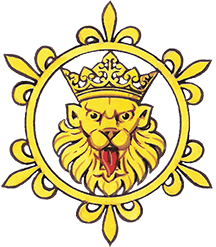 A more defined lecture was presented at the 20th International Congress of Genealogical and Heraldic Sciences held in Uppsala from the 9th to the 13th of August 1992, and published by the Swedish National Committee for Genealogy and Heraldry, in its proceedings, pp. 194-206. A short article was published in the Chronicle of The Friends of Canterbury Cathedral. This present essay is a work of detection, building up largely circumstantial evidence to support speculation in the absence of any original record. Specific references and comments would take up many further pages. 2. It seems probable that Arundel’s effigy was in the form of a monumental brass resting on the table now in the cloister. The matrix of such an Episcopal brass lies alongside under the shield of Arms of Archbishop Arundel and would fit as the top of that table. 3. The two sides facing into the cloister would have formed the outsides of the monument when in the nave, the inner sides, now facing out into the garth, would not have required any heraldic decoration and there is none. The publication in 1997 of “The Canterbury Cathedral Nave” by Brockley, Sparks and Tatton-Brown has raised a few issues in connection with the above theory which need to be addressed, but despite this it still seems plausible that the cloister “lavabo” contains elements of Arundel’s tomb. The first problem is that the sides of Arundel’s tomb fully occupied the space between two pillars of the nave ( Brockley et al fig 30) which is approximately twice the width of the space occupied by each canopy in the cloister. This is not actually a problem, because there could easily have been two arches on each side of the tomb. Intriguingly, the space occupied by Arundel’s tomb in the nave is quite close to that occupied by the tomb of Henry IV, which might explain both the location of Arundel’s tomb and the fact that the king’s canopy is made of wood, when stone would have been traditional. Arundel’s stone canopy would have been unsuitable for the monarch, and could therefore have been retained for his own use elsewhere. The second problem is that there is good contemporary evidence that Arundel’s tomb was demolished in 1540 ( Brockely pg 147 and 149), to this point I will return. I share Cecil’s reservations about the existing “lavabo”. A great Benedictine abbey would have possessed a large circular building with a central fountain in the cloister outside the refectory, and there are early illustrations of just such a building in this location at Canterbury. It would have been surplus to requirements after the abbey was dissolved, and must have been demolished. This would have left a large double doorway in the cloister needing to be filled, plausibly at the very time when there were some fine architectural fragments available from a demolished tomb.